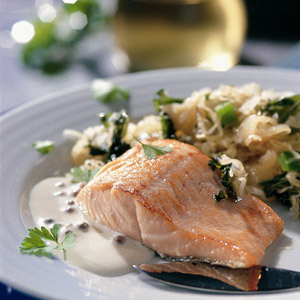 Fish and sauerkraut is a popular combination in Germany, particularly using freshwater river and lake fish. For a lighter Sauerkraut flavor, look for Weinkraut which is steeped in white wine. It is very tasty stir-fried with shredded fresh cabbage. Prepare the vegetables first. Cut the hard central core from the cabbage, and using a sharp knife shred as finely as possible. Rinse the Sauerkraut in cold water then drain well, squeezing as dry as possible with the back of a ladle. Pat dry with paper towels. Heat 2 tablespoons of the oil in a wok and stir-fry the onion and green pepper for 2 minutes. Add the fresh green cabbage and fry for another 2 minutes, then mix in the Sauerkraut and cook until piping hot. Season well, especially with pepper. Set aside to keep warm. Heat the remaining oil in a large frying pan. Season the salmon and pan-fry for 3 minutes on the top side until nicely caramelized. Turn over carefully and fry the underside for 2-3 minutes until the flesh feels firm but not hard. Remove the fish to a warm plate. Pour the wine into the pan along with the pink peppercorns and bubble until reduced by half. Stir in the quark (or sour cream), season and remove the pan from the heat. Divide the vegetable stir-fry between four warm plates. Place a salmon fillet on top an spoon over the sauce. Sprinkle with some chopped parsley and serve.